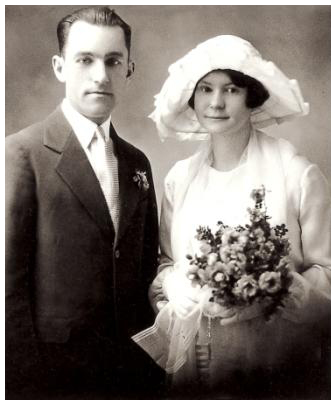 Born September 18, 1930, Washington, D.C. His parents: Louis F. Schwartz and Cedelia A. Bourassa. 1936 – 1944–Holy Name Elementary School in Washington, D.C.
1944 – 1948–St. Charles Minor Seminary in Catonsville, Maryland. 1948 – 1952–Maryknoll College, B.A. Degree, Lakewood, New Jersey and Glen Ellen, Illinois. 1953 – 1957–Theology Degree, Louvain University, Belgium. June 29, 1957–Ordination to the Priesthood in St. Martin’s Church, Washington, D.C. by Bishop McNamara, Auxiliary Bishop of Washington. December 8, 1957–Arrived in Korea; Incardinated in the Diocese of Busan, Korea. January 20, 1958–Afflicted with hepatitis; returned to U.S. for recuperation. 1959 – 1961–Toured U.S. and Europe with Korean Bishop to raise money for the missions. March 1961–Established Korean Relief, Inc., fundraising Operation in Washington, D.C.
December 1961— Returned to Korea to begin again his Missionary Work. June 1962–Appointed Pastor of Song-do Parish in Busan, Korea. 1963 – 1969–Initiated Operation Hanky Self-help Embroidery Program in Busan, Korea which employed 3,000 slum dwellers. August 15, 1964–Started family-unit orphan program in Busan, Korea; accepted first group of orphans. September 1966–Opened first dispensary in slums in Amni-Dong in Busan, Korea. January 1967–Opened two more slum dispensaries in Anam-Dong and Bosudong in Busan, Korea. October, 1967–Resigned as pastor to work full time with Orphan Program. December, 1968–Built Amni-Dong Free Middle School for children in Busan, Korea. July 1969–Took over operation of Kuhoso Sanatorium in Busan, Korea now serving 75 TB patients. October 1969–Built Amnamdong School in Busan, Korea; intended to be a middle school for boys in Busan and became first Boystown Program. April 10, 1970–Accepted 300 vagrant boys and greatly expanded Boystown program. October 25, 1970–Built Sisters of Mary Mercy Hospital in Busan, Korea; 120-bed full-service hospital totally free for the poor. January 1, 1975–Inauguration of the Boystown Program in Seoul, Korea. January 6, 1981–Began program for 400 severely retarded children in Seoul, Korea. January 6, 1981–Took over care of 1,800 destitute and homeless men from the City of Seoul, Korea. May 10, 1981–Founded the Society of the Brothers of Christ Religious Order, now caring for the homeless men in Seoul, Korea and homeless and mentally challenged adults and out-of-school youth in the Philippines. June 29, 1982–Built second Sisters of Mary Doty Memorial Hospital in Seoul, Korea; 120 bed full-service hospital totally free for the poor. June 29, 1982–25th Anniversary of Fr. Al’s Ordination to Priesthood. February 12, 1985–Arrived in Manila at invitation of Jamie Cardinal Sin to begin Boystown/Girlstown Program in Manila, Philippines. 1985 to 1992–Began Medical Program for 2,000 destitute tuberculosis patients in Manila, Philippines; Sisters of Mary operated the Charity Pavilion at Quezon Institute until the facility was closed by the government. August 15, 1986–Inauguration of the Girlstown\Boystown Program in Manila, Philippines; at full capacity serves 3,500 children. October, 1989–Diagnosed with Amyotrophic Lateral Sclerosis (Lou Gehrig’s disease). 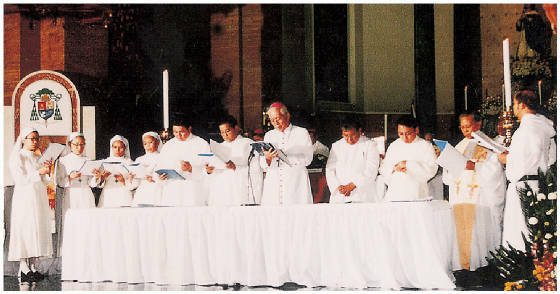 February 1, 1990–Elevated to Right Reverend Monsignor; Investiture ceremony in Manila, Philippines. August 23, 1990–Inauguration of the Girlstown Program in Cebu, Philippines; at full capacity serves 3,000 girls. 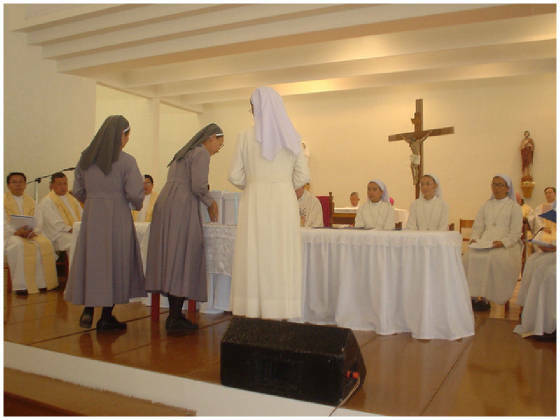 September 12, 1990–Sisters of Mary arrived in Mexico to begin Boystown/Girlstown Program in Chalco, Mexico. 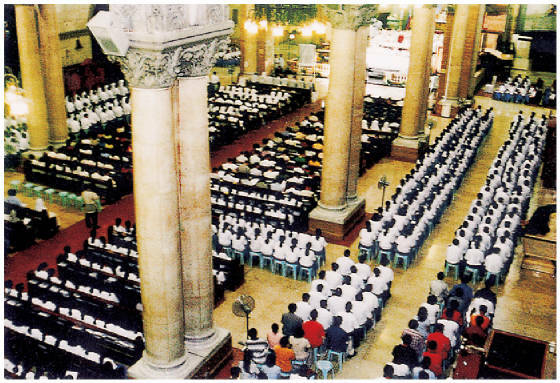 October 1, 1990–Father Al Celebrated 60th birthday in Busan, Korea; 1,000 graduates returned for celebration. July 23, 1991–Inauguration of the Boystown Program in Silang, Cavite, Philippines; at full capacity serves 3,000 boys. October 7, 1991–Inauguration of the Boystown\Girlstown Program in Chalco, Mexico; at full capacity serves 3,000 youngsters. March 16, 1992–Father Aloysius Schwartz died of Amyotrophic Lateral Sclerosis (Lou Gehrig’s disease), Manila, Philippines, a few hours after naming Sister Michaela Kim of the Sisters of Mary as his successor. On October 2003, Fr. Al’s Commission Office (FACO) was created with the primary purpose of working for the beatification and canonization of the Servant of God, Msgr. Aloysius Schwartz. The Commission is in charge in preparing the necessary documents required by the Congregation for the Causes of Saints. The Commission, in line with its objective, is also concerned for the spiritual activities essential for making our dear Fr. Al a saint. The Nihil Obstat (the go signal to proceed with the process) for the Cause of Fr. Al Schwartz was received on November 27, 2003. On December 10, 2003, the Archdiocesan Process for the Beatification and Canonization of Venerable Al was formally opened at the Basilica of the Immaculate Conception (Manila Cathedral) Intramuros, Manila, Philippines. On January 24, 2004, the Rogatory Commision was formed and undertook its office in Korea where they completed the depositions of the witnesses in such place. 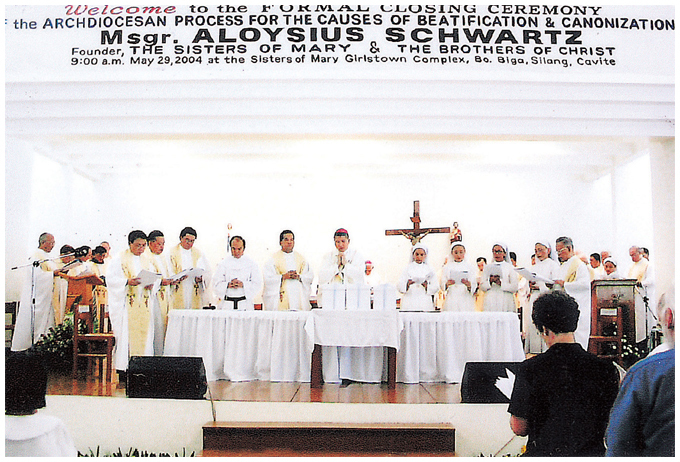 On May 29, 2004 at the Sisters of Mary Girlstown Complex, Brgy. Biga II, Silang Cavite, Philippines, Most Rev. Socrates B. Villegas, Auxiliary Bishop of Manila and Episcopal Delegate in behalf of His Excellency Gaudencio Cardinal Rosales, Archbishop of Manila, solemnly declared theArchdiocesan Process of the Beatification and Canonization of the Servant of God, Msgr. Aloysius Schwartz closed. 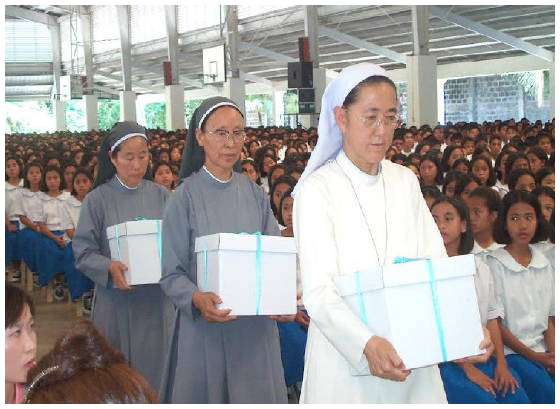 Sr. Michaela Kim, Sister Sophia Kim and Sister Juliana Hu carry three boxes of the original Acts (documents) that were prepared about the life of Father Al to hand carry to the Vatican for the Beatification Cause. Subsequently, the documents were presented in Rome by the Postulator, Fr. Samson Silloriquez, OAR, with Sr. Maria Cho, SM and Sr. Teresita Sumalabe, SM. The Sisters of Mary entrusted to the latter the undertaking of Fr. Al’s Commission Office (FACO). With the blessings of the Almighty God, the Archdiocesan Process of the Beatification and Canonization of the Servant of God, Msgr. Aloysius Schwartz, received the approval from Holy See last May 20, 2005. Last October 6, 2012, His Eminence Luis Antonio Cardinal Tagle of the Archdiocese of Manila together with Fr. Samson Silloriquez, OAR (Postulator), Fr. Zdzislaw Józef Kijas, OFMConv (Relator) and three Sisters of Mary presented and submitted the “Positio” about the Life, Virtues and Fame of Sanctity of Msgr. Aloysius Schwartz to His Eminence Angelo Cardinal Amato, S.D.B., Prefect for the Congregation for the Causes of Saints. On March 6, 2014, the theologians commissioned by the Congregation for the Causes of Saints in Rome to study the Positio unanimously approved Msgr. Al’s heroic practice of virtues. It will move on to the Commission of Cardinals and Bishops and finally to the Pope for the formulation of the decree for Msgr. Al to be declared Venerable. On December 16, 2014, the College of Cardinals approved the heroicity of the virtues of Father Al. On January 22, 2015, Pope Francis, in a private audience with Cardinal Angelo Amato, S.D.B., authorized the Congregation of Saints to promulgate the decree of heroic virtue of Aloysius Schwartz, thus giving him the title of “Venerable”. We beg your prayers for the success of this cause, for it is only through prayer that we could partake in bringing our dear Fr. Al into the Altar of God in the company of other Saints.